No matter how many years go by (18, to be exact, and woah, we feel super old now), the 1995 teen comedy always seems to stay relevant. It’s one of those classic movies that’s, like, totally timeless. This past October, “Entertainment Weekly” brought the cast back together for a special reunion-themed issue, and fashion brand Wildfox Couture just released their “Clueless”-inspired spring lookbook. 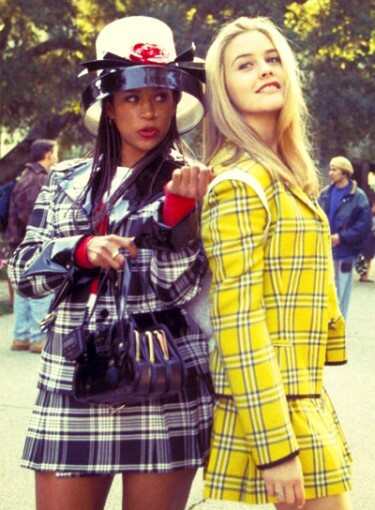 And while there’s much to love about “Clueless,” we’re clearly the most obsessed with the fashion. We still remember the pang of jealousy we felt when we first watched Cher choose an outfit from her massive closet using that awesome computer system. Click here to see our favorite Clueless-inspired fashion. She ended up choosing a mustard yellow plaid blazer with a matching skirt and knee-high socks. Not exactly what we would have gone for … and yet Cher totally pulled it off. And that’s the thing about “Clueless” and fashion: Most of the outfits are oh-so-’90s and completely over-the-top, but there are elements of each outfit that are actually really chic. So, we’ve cherry picked our favorite clothes from “Clueless” and reinvented them for the year 2013. OK, got that out of your system? Keep clicking.